Some people have a hard time finding an upper-arm blood pressure cuff that fits well, or find the whole process of having their arm squeezed to be very uncomfortable. If either of these sound like you, you might have a more pleasant experience with a wrist blood pressure monitor, which most users say are a lot more comfortable than upper arm monitors. The biggest downside of wrist monitors is that you must have them positioned just so, every single time, to get accurate and consistent readings. 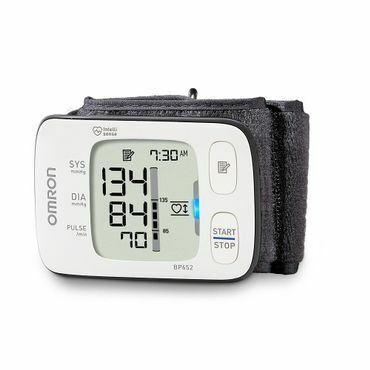 Our best-reviewed model, the Omron BP652N (Est. $60), makes that easy with lights that signal proper positioning: orange when the monitor is out of position, blue when it's lined up correctly. You can also set it to give audible guidance signals. The BP652N draws Very Good accuracy ratings from Consumer Reports, and quite a few owners say they've compared it with their doctor's equipment and found it to be very accurate. However, all of that is dependent on mastering the learning curve that goes with its positioning guidance system. The BP652N stores up to 100 date- and time-stamped readings, alerts you if you have an irregular heartbeat, automatically shows how your blood pressure compares to international guidelines, and can average up to three readings taken in a 10-minute span. It also comes with a storage case and is covered by a five-year limited warranty, although we found a few comments that customer service is so-so -- generally responsive, but not always very helpful. The Omron BP652N receives Excellent comfort scores Consumer Reports, a sentiment echoed by the thousands of users that have reviewed it. However, a few of them are disappointed to see that a recent update to this model replaced its semi-rigid wrist cuff -- which was easy to get on and off your own wrist -- with a soft, flexible cuff that is a bit more challenging to get just right. Still, most say it's still much easier to handle than an upper-arm blood pressure cuff. Omron also offers a basic wrist model, the Omron BP629N (Est. $40). It doesn't have the advanced guidance system, but it can calculate the average of your last three recent readings taken within 10 minutes, and most users say it's quick, easy to use, and accurate as long as you master the proper positioning. As with all home blood pressure monitors, be sure to take this model to your doctor's office so you can verify that you're getting the positioning right, and thus accurate readings. The BP629 stores up to 60 date- and time-stamped readings and is covered by a two-year warranty; both it and the Omron BP652N run on 2 AAA batteries. The following model isn't reviewed or tested for accuracy in any professional comparisons, nor are its ratings quite as high as those the Omron models receive. But, if you'd like to spend less money and get more features, take a look at the Ozeri BP01K (Est. $30). This wrist monitor comes with some very user-friendly features, including large, easy to read digits and a green, orange or red indicator to tell you if your blood pressure is normal, borderline high, or high. It also detects irregular heartbeats, has a push-button function to average out your most recent blood pressure readings for accuracy, and stores up to 90 readings for each of two user accounts, all time- and date-stamped. The Ozeri BP01K also measures your blood pressure as it inflates, instead of overinflating and then taking the measurement as it deflates -- a feature that users really like. They also love how comfortable this monitor is, and say it's easy to put on by yourself. That said, getting wrist monitors positioned correctly is such a delicate affair that we're not surprised to see some user concerns about accuracy. That, plus the fact that we've found no clinical studies or professional tests to verify this model's accuracy, makes it especially important that you take this blood pressure monitor to your doctor's office when you first get it, and then at regular intervals afterward, to confirm that your readings at home are accurate. All three wrist blood pressure monitors come with one-size-fits-most cuffs; the two Omron models accommodate a wrist circumference of 5.25 to 8.5 inches (13 to 21 cm), and the Ozeri model accommodates wrists 5.3 to 7.6 inches (13.5 to 19.5 cm) in circumference. Keys that are easy to use, and a display that's easy to read. Circuitry that detects -- and compensates for -- an irregular heartbeat. A cuff that fits you.